430 Redhill - Earlswood - Hospital - Woodhatch - South Park - Reigate ? ?m High e.g. Derby Day 1962 0. Occasional only. 447 Merstham (South) Delabole Road - Redhill - Earlswoood - Hospital - Meadvale - Reigate - Batts Hill - Redhill ?? m Low (Battlebridge Lane, Merstham x 2) 6/10/1954 - 24/12/1967 1. Peak journeys only. This frequent service route was normally operated by RF single deckers, but an RLH was used during peak journeys for added capacity. The route served a new council estate, which was built in Merstham in 1953/4. There were actually two low bridges on the way, approximately 100 yards apart; one arched and one flat. In 2002, they still existed, although the arched one was labelled 13'0". The core route was Merstham - Redhill - Earlswood - Reigate. Around half of the buses then continued on an extension which started by going down Holmesdale Road and Doods Road, and finished at Redhill. However the routing to Redhill changed. Until around 1955 they went directly via Shaw's Corner, Hatchlands Road and Station Road. After that date they went instead via Batts Hill Road, Timpereley Gardens and North Street (being the routing shown on the map, as the dotted green line). Services then returned back in the opposite direction (i.e., this was not a circular route). This service may have been provided primarily for Reigate County (girls') School. 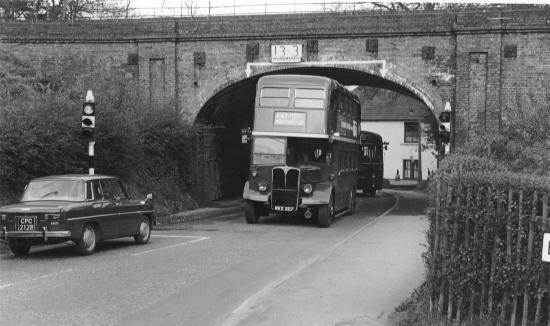 There was only one morning service, which left Merstham at around 0830, called at Redhill, went directly via Main Road to finish at Reigate just before 0900 (actually, in 1955 it carried on the 447 route back to Redhill via Doods Road, but not by 1967). There was no afternoon service in 1955. But by 1967, there was one, which left Reigate (Red Cross) at 1533 and went via Main Road to finish at Redhill Station at 1605. On mornings there were lots of 447B services from Reigate via Blackborough Road to Merstham, all arriving before around 0800, so many they must have been worked by RFs. The reason for this may have been simply to get the buses back to Merstham as quickly as possible, to return with commuters. Only one of these worked back as a 447B (the first bus of the day, at around 0620, after a few minutes layover). It is possible the RLH worked this and then also the morning 447A mentioned above. There was no afternoon service in 1955. But in 1967, there was one, which left Reigate at 1556 and went via Blackborough Road to Redhill and on to Merstham, arriving 1619. This was probably provided for pupils of Reigate Grammar (boys') School. There was no return journey advertised so it probably ran back empty. Since these times overlap with the afternoon 447A, the RLH could only have done the 447B turn.
" I remember always trying to get the steam loco numbers at Redhill Station as we passed, as this was generally a Manor loco from the Western Region, unusual in our neck of the woods, and have vague recollections of the view being better from upstairs which could only be from an RLH ... 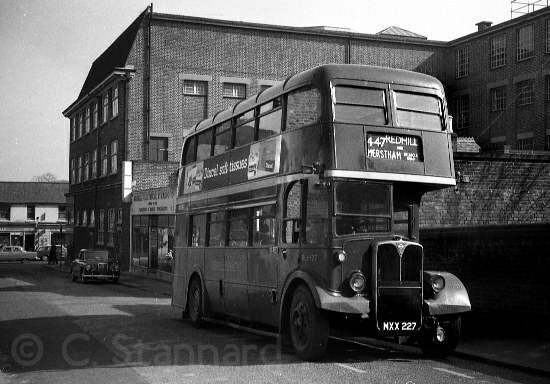 The 447B started at Reigate Bus Garage and ran up Blackborough Road, second stop was where the RGS boys got on, unless we were coming back from games at the school fields on the other side of town when we would generally get on at the garage, against the rules, but who cares. Route used to continue along past the war memorial and come down the hill into Redhill rather than the longer more traditional route of the 447. This only ran once a day, and was RLH 41 99% of the time ... Route used to terminate, as per the standard 447 route, at Delabole Road on the council estate which I used to live on. I have a vague recollection of there being a 447C for a short time but that was another single decker job ... Certainly RLH 41 was incredibly reliable, we travelled on it day after day, week after week, usually heavily loaded, with all seats taken and standing passengers on upper and lower decks and on occasion on the platform as well, and the old girl took it all without complaint. Mind you, the upper deck seating arrangements could make for lengthy stops, but as we travelled regularly generally those who were travelling to the end of the route at or near Delabole, called by certain conductors hell-of-a-hole, Road, would sit in the front upper seats. There was a sort of unwritten pecking order of reserved seats to ensure that stopping times were not prolonged unduly. London Transport surely got their moneys worth from this fleet of work horses. " The garage on Bell Street was also the address of London Transport Country Area headquarters.